2 April 2019: John Freeth has very kindly allowed a selection of his 'end of steam' photos to be featured on the site. Of particular interest are a set of three photos depicting a visit by 'Kolaphur' to Hall Royd, which features a rarely photographed view from the south taken from a train leaving Millwood Tunnel and taking the Copy Pit line. John also took a number of 'classic' shots of a number of 'end of steam' excursions on the Copy Pit line, both approaching Copy Pit and crossing Lydgate viaduct (scroll down to see the full set). An extensive selection of John's work can be viewed on Flickr, and these include a photo of 45374 after it was removed to Oxenholme having been run into when stationary with an Inspection Saloon one mile south of Lambrigg Crossing Box on Grayrigg bank on 19 October 1967. The other loco involved was banker Standard 4 75042. The tenders of both engines were derailed and the inspection saloon ended up at right angles across the West Coast mainline, which was blocked for twelve hours. Both engines involved were subsequently withdrawn. I record it here as it is an incident that I have not previously read about. A Hall Royd favourite is Jubilee 'Alberta' and John snapped her in Leeds Holbeck shed on 26 March 1967. These, and other gems, feature in John's collection. 2 April 2019: The sequence of photos following a freight train up Copy Pit, with views from the footplate, more logically arranged in route order, and an Eric Bentley image of an excursion arriving at Copy Pit added. 1 April 2019: Added photos of Chew Moor Sidings signal box; Wardleworth box with Pug 51218; 90481 exiting Horsefall Tunnel with a westbound freight on 30 July 1966 and Stanier 8Fs 48218 & 48711 at Stansfield Hall Junction on 10 June 1967. 25 March 2019: Grateful to GNR Auctions for permission to include a photo of the final signal box diagram at Gannow Junction. 15 March 2019: An image of the Portsmouth signal box diagram (1969-1973), and also of the LMSR Dover Bridge diagram (with detailed notes) added, together with a 1966 shot of Cornholme signal box taken from the hillside above the valley added. 13 March 2019: Problems with the search facility (top right hand corner of each page), created when the site was re-hosted in December 2018, now corrected. 12 March 2019: Added Class 104 DMU detail shots for underframe; saloon interior; guard's van and exterior. 10 March 2019: First of a series of Class 104 DMU detail shots, starting with the underframes, shot at the Llangollen Railway on Thursday 7 March 2019. 6 March 2019: David Blaxhall has kindly shared the photos he took on Saturday 8 December 2018 when BR Standard 70000 Britannia passed through Todmorden. 19 February 2019: Added another of Eric Bentley's wonderful photographs added to the site; British Railways Standard 7MT 4-6-2 No. 70000 arriving at Manchester Victoria at 10.35 a.m.on Saturday 5 June 1965. 11 February 2019: The 2mm set of signal transfers for BR/LMS Upper Quadrant signals has been fully revised and updated, and a new set of 2mm transfers for GWR/Western Region signals created. 3 February 2019: A dimensioned drawing of GWR folded edge steel signal arms added (Home, Distant, Shunting and Subsidiary arms & spectacle castings). 1 February 2019: Further notes from 'Modern Railways' relating to the Calder Valley main line, this time for 1964. 28 January 2019: Further notes added to the page on the 'Northern Rubber Special' extracted from an article in 'Trains Illustrated' December 1961. 27 January 2019: More Motive Power Miscellany from 1962 - V2 traverse the Calder Valley for the first time? 25 January 2019: More extracts from Trains Illustrated, now looking in detail at 1960. 22 January 2019: Calder Valley highlights extracted from Motive Power Miscellany in Trains Illustrated Jan - October 1961. 22 January 2019: Added notes on material of railway interest in Roger Birch's Todmorden Albums 1 & 2. 7 January 2019: Further notes on last sightings of maroon BR Mark 1 coaches. 28 December 2018: Date of an 'incident' at Tanybwlch, Ffestiniog Railway corrected to 31 July 1966, with thanks to Bernard Cruickshank. Previous photos now enhanced. 27 December 2018: Added a postcard showing a standard gauge loco hauling Low Moor waggons between the New and Old Works in Low Moor, together with a 'modern' street view courtesy of Google. 24 December 2018: There have been serious issues of availability over the last few months, and today the site has been rehosted to give visitors a better experience. 19 December 2018: The Class 124 has its door hinges applied... Added a photo by Ray Honke showing much of the steam-era infrastructure still in place 9 months after the Preston signaling scheme was commissioned. 14 December 2018: Added a snap of the October 1964 issue of 'Modern Railways' which has a detailed photo of the Hall Royd Up bracket signal. 12 December 2018: Added Eric Bentley's photo of 60022 'Mallard' passing Hall Royd Junction with Alan Peglar's 'Northern Rubber Special' on 30 September 1961; Graham Roose's photo of 31290 enters the engineering sidings at Hall Royd Junction with a Permanent Way train on 12 November 1980; English Electric Class 37 37252 passing Hall Royd Junction with empty oil tanks on 12 November 1980; and WD 90658 heads towards the entrance to Holme Tunnel and Rose Grove with a loaded coal train whilst the 13:30 Blackpool Central - Wakefield Kirkgate hauled by an unidentified Black 5 on 30 September 1961 at 15:20 pm. 21 November 2018: Further work on the underframes of the Silver Fox Class 124 6-car set. 18 November 2018: Notes on how to fit the glazing strips to a Silver Fox DMU kit. 13 November 2018: Work on populating the interior of the Class 124 DMU completed, and the cabs get a coat of warning panel yellow. 4 November 2018: A Trans-Pennine Class 124 for the Calder Valley: initial notes. 3 November 2018: A 30 inch radius cross-over has been replaced in a tight spot with 60 inch radius points: here is a step-by-step guide. 23 August 2018: A list has been created following the frustration of identifying LYR 4mm locomotive kits. Shapeways has a number of items. 15 August 2018: Added some notes on the last three BR steam locos to visit Todmorden on 3 August 1968. 14 August 2018: A poor running Hornby Class 110 unit has been completely re-invigorated with a pair of Black Beetle motor bogies. 14 August 2018: Sadly, there seems little prospect of restoring the Network Rail feed that powered the Train Tracker feature and therefore these pages have now been retired. 13 July 2018: A major upgrade of the storage yards completed with new roads laid, existing roads extended and a dedicated DMU marshalling area created. 14 May 2018: Sorry to report that Network Rail have inadvertently deactivated the access to the signalling data feeds, and consequently the Train Tracker pages are not working. A fresh application has been made but we are 523rd in the queue, and restoration may take a little time. 2 May 2018: An old split-frame Bachmann B1 has emerged from the back of the stock draw, with the aim of devising a low-cost restoration. 26 April 2018: Stage 1 of the construction of a 0-8-0 Lanky Class 31 is now complete, and the loco have been running-in for the last couple of evenings. 22 April 2018: What would a 0-8-0 Lanky Class 31 have looked liked had they survived in service till 1964?. 20 April 2018: Smokebox number plate and shed plate applied to the 0-8-0 Lanky Class 31. 19 April 2018: First set of BR numbers applied to the 0-8-0 Lanky Class 31. 18 April 2018: Final fettling for the 0-8-0 Lanky Class 31 and first coat of matt black. 16 April 2018: Lampirons and crew seats fitted to the 0-8-0 Lanky Class 31 over the weekend. 12 April 2018: More progress on the 0-8-0 Lanky Class 31 with the tender primed and the loco handrails fitted. 9 April 2018: The 0-8-0 Lanky Class 31 has had its wheels removed, chassis painted, and then reassembled. 7 April 2018: A decision has been made as to which Class 31 LYR 0-8-0 is to be modelled following intense Web searching for photos of the locos in BR days. Consequently the prototype notes have been updated. 6 April 2018: Added notes on the demise of the Lanky Class 31 0-8-0 type. Alternative cab sheets added, plus buffer beams and couplings to the model Class 31. 5 April 2018: New pick-ups and the 0-8-0 Lanky Class 31 and its tender coupled together. 4 April 2018: Tender for the 0-8-0 Lanky Class 31 trial assembled, and the chassis and body trial fitted. 3 April 2018: More work on the 0-8-0 Lanky Class 31 with the smokebox door, splashers, chimney, dome and cab roof fitted. 2 April 2018: The boiler unit of the LYR Class 31 completed; the underside of the barrel rebuilt and the smokebox saddle created. 30 March 2018: A trial fit of the backhead + firebox + boiler barrel of the LYR Class 31 trial assembled. 29 March 2018: Need to try and keep the site up-to-date. The lack of posts hides frantic activity in the workshop with four locos having the finishing touches applied in the last couple of weeks. One project that is kicking off is a Sutherland Models 'Cotswold' kit of a L&YR 7F 0-8-0 heavy goods loco kit. 28 February 2018: The BRCW Class 110s were synonymous with the Calder Valley but there are issues with the Hornby model. A recent upgrade has involved fitting replacement LIMA bogies. 28 February 2018: An earlier repair to a Hornby Royal Scot suffering from 'mazakrot' has spectacularly failed, although a new method for securing the front motor retaining casting was a success. 29 January 2018: Problems with trains running more slowly using the NCE Powercab resolved courtesy of Digitrains. 23 December 2017: Details of the latest signalling book from the LYRS: "Last Levers on the Fylde". Highly recommended! Also Chris Littleworth has provided a modified diagram for Todmorden East Junction incorporating fresh detail relating to the Bay Platform and warehouse siding. 22 December 2017: Posted the only known photograph taken from Bridge 109 taken in July 1968 taken by Eddie Bobrowski. 22 November 2017: Following Gavin Clark's article in 'Model Railway Journal' issue 259, Simon Edmunds has kindly provided an image of this Website's LYR Type 6 signal box kit as it appeared on the Kerrinhead P4 layout at Scalefour North 2015. 17 November 2017: Added a shot showing Todmorden in all its glory as a Black 5 waits to restart its train eastwards in 1968, and also two BR Standard 5s crossing Lydgate Viaduct in the last weeks of BR steam. 14 November 2017: Added a note on where to buy Romford axles from, other than Markits in Watford. 13 November 2017: The new PECO point prompted much reading up on the development of point timbering, leading to the discovery that whilst the Permanent Way Institute developed a British standard from 1920 onwards, which saw the layout of point timbering we see today, the GWR decided to retain the equalised layout of point timbers up to its demise in 1948. 8 November 2017: First observations of the new PECO OO bullhead point. 1 November 2017: Not a new page as such, but discovered an orphan, so am now providing link to a page showing Pacer 55806 reversing at Hall Royd in the days when Hebden Bridge terminators had to run on to Hall Royd to reverse. 30 October 2017: Evolution of a model railway layout: how Hall Royd Junction has evolved to better reflect the actual traffic that passed through Todmorden. 25 October 2017: Problems with a Bachmann WD 2-8-0 resolved with the fitting of a new decoder due to overheating: read more. 21 October 2017: Final wrap-up on the Minx point and signal system. 20 October 2017: Its some 12 years since the Essex Steamtrain running on the Valley Railroad in Connecticut was visited. The state of play on 29 September 2017 is recorded here. 19 October 2017: The latest Railway Jolly involved a trip on the Mount Washington Cog Railway in early October 2017. 18 October 2017: Hall Royd the model needed a double junction on a curve. This is how a diamond crossing with a curved track was built to match PECO OO pointwork. 17 October 2017: One of the block instruments from Hall Royd appeared at the Great Northern Railwayana Auctions on 7 October - thanks to GNRA for permission to share their images here. 19 September 2017: Atmospheric photo by Eric Bentley added showing westbound freight approaching Todmorden at 07.10 am on Saturday 10 June 1967. 10 September 2017: Added P B Booth's splendid photo of 'Mallard' passing Hall Royd Junction with the Northern Rubber Special on 30 September 1961, courtesy of The Transport Library. 24 August 2017: An image of two light WD 2-8-0 freight locos rolling eastwards past Eastwood signal box in 1965 added. 27 July 2017: More on 'Greg' - the loco re-assembled and ready for a DCC socket to be fitted. 26 July 2017: Better way of fixing PVC/vinyl backscenes tested and applied. 20 May 2017: The last week of the Class 121s on the Aylesbury - Princes Risborough service recorded here. 1 March 2017: Updated the page on model loco wheel cleaning. 28 February 2017: The Stansfield Hall pages reworked so that steam images from the 1950s and 60s now have their own page, including new images showing 9Fs, the signal box from the south (showing the lavatory extension) and the footbridge before rebuilding, whilst the images showing the reconstruction of the West Chord 2012 - 2014 now have their own dedicated page. 14 February 2016: A set of images recording an up freight powered by 90412 and 42727 was recorded at various points between Kitson Wood Tunnel and the summit at Copy Pit in the 1960s can be viewed here. 10 February 2017: The new staging (aka Manchester Victoria) is now in place, with physical connection to the rest of the layout now completed at both ends. 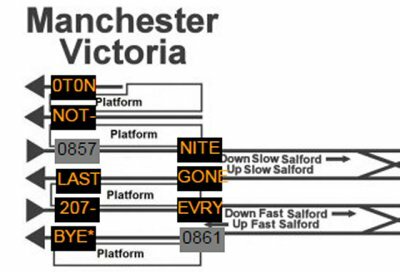 1 February 2017: It has taken a month, but the new staging for the layout - representing Manchester Victoria - has now been installed. 13 January 2017: Gradient profiles for the Low Moor Mineral Tramway 'main line' and Brighouse branches added. 11 January 2017: Further notes and photographs added to the Clifton Colliery Tramway page. 29 December 2016: Added a page of notes of the Clifton Colliery Railway and the interconnected Low Moor Ironworks system. 13 December 2016: The access platform for the LNWR/LMS signal gantry completed and trial fitted. 12 December 2016: A start has been made on the access platform for the LMS signal gantry. 9 December 2016: Further progress on the 4mm model of Hall Royd Junction's early LMS signal gantry. Signal arms rodded-up, and trial fitted on the layout. 5 December 2016: Angle cranks and initial rodding fitted to the L&NWR signal bridge. 1 December 2016: Started a new page detailing the construction of the L&NWR signal gantry located at the western end of Millwood Tunnel, and erected in the early LMS period. 23 November 2016: Added a page detailing the model signals that have recently been commissioned at Hall Royd Junction. 11 November 2016: Installing DCC Accessory Decoders this week has highlighted a number of issues in the instructions (or lack of them) with certain brands. Hall Royd investigates how to programme LDT, Cobalt and Minx DCC decoders using the NCE Powercab throttle. 7 November 2016: Huge apologies to everyone who was accessing the Signal Box Watcher facility until its unexpected demise in late October. This has now been fixed, and is operational again. 3 November 2016: Added further photographs of Summer Saturday excursions between Gannow Junction and Holme taken in 1966. Also added a photo of a 1966 steam-hauled excursion passing Todmorden goods yard. 2 November 2016: Additional notes on the use of the NCE Powercab 10 months after the original installation, including the installation of additional sockets for throttles and the Auto SW module for the programming track. 1 November 2016: Added a page outlining Stanier Jubilee activity at Hall Royd and Todmorden in the BR era. 31 October 2016: Added a photo of Westhoughton signal box showing Jubilee 'Hood' passing it in 1966. 19 October 2016: Added photographs taken at the Eat Anglian Railway Museum showing carriage seating fabrics and patterns used by BR, and also a genuine LNER carriage seat. 6 October 2016: Added an image of 44818 leaving Rochdale with Walmsleys (Bury) Ltd special train no 2 1Z13 08.55 Rochdale – Blackpool North 08.58 Saturday 14 May 1966. 30 September 2016: Point rodding is essential for a layout with a signal box, and now it is being laid in earnest. 29 September 2016: The Royal Scots had a very short fling in front line Calder Valley service when three was allocated to Low Moor. Added a shot of 46113 'Cameronian' on a Southport - Leeds/Bradford working in mid-1962. 28 September 2016: Further notes and images added on the creation of photographic backscenes. 27 September 2016: Further updates to the page detailing the signalling at Bolton West, with thanks to Vernon Sidlow for his shot of the 'Belfast Boat Train'. Also added is one of Eric Bentley's photographs showing the pair of brackets that controlled access to the lines to Preston and Wigan as they were on 23 April 1966. 26 September 2016: An interesting Past & Present view of the last L&YR signal in BR service at Bolton West. 21 September 2016: It has taken 3.25 years, but the panoramas shot back in 19 April 2013 have finally materialised at some 30 feet of photographic backscene.The tale of how they were produced is detailed here. 16 September 2016: Details of the hen huts at Kiln Clough updated. 11 September 2016: Images of the Bradley Wood Junction added, and also at Anchor Pit to show the site of the 7 December 1904 'railway crash'. 7 September 2016: Further work on the end windows York MPD's Route Learning Card DE 320765. 1 September 2016: A previously repaired Hornby Scot chassis finally fitted with a Mainline Jubilee body. 29 August 2016: A photo survey of Bradley Wood signal box name board, showing rear and fixing points. 25 August 2016: First steps recorded in the creation of a model of York MPD's Route Learning Card DE 320765. 25 August 2916: Started a page dealing with Rose Grove, an East Lancashire Rail Centre in 1968. 24 August 2016: Added a image of Sowerby Bridge showing 4MT tank 42410 running round the Leeds portion of Leeds + Bradford – Blackpool excursion on Saturday 2 October 1965. Also two shots of Stanier Jubilee 45694 (56A) 'Bellerophon' passing Cornholme between Todmorden and Copy Pit with 1X19 Castleford Central – Blackpool North Excursion 10.00 Easter Monday 11 April 1966. An image of Tottington Junction signal box and Burscough North Junction also added. 22 August 2016: Another of Eric Bentley's wonderful photos added, this time showing the rear of the Down platform at Todmorden Station in April 1966, and the station-side of the warehouse at the end of Todmorden Goods Yard. 13 August 2016: What coloured lining do you need for BR maroon coaches? old gold, yellow or straw... Hall Roy has produced a guide dealing with lining colours, location of numbers, when the ends were painted the same colour as the bodyside, when and where to place the BR roundall...and possibly the last known sighting of a maroon carriage in the Calder Valley in the summer of 1972. 8 August 2016: Pennine Heritage have created a remarkable digital archive of images of the Calder Valley, many of which has a strong railway interest. Many are contributed by the Lancashire & Yorkshire Railway Society, but many are also held in private collections. A full index of the Pennine Heritage railway images has now been created, and can be viewed here. 1 August 2016: Details of another Hornby Royal Scot chassis rescue provided. In this case, the chassis block had spit into two. 30 July 2016: Added links to images of signal boxes in the Liverpool area. 1 July 2016: Updated the Pennine Heritage links on the L&Y Signal Box images page. 9 June 2016: The provision of reliable motor and gearbox assemblies has been a bit of a problem at Hall Royd since the demise of the Portescap RG4, exacerbated when the last virgin Keen Maygib RG4 was recently fitted to one of the layout's Jubilees. Now Hall Royd offers a blow-by-blow account of how to assemble a pair of the Hi-Level gear boxes. 30 May 2016: Geoff William's outstanding 18.2mm model of Aylesbury was recorded at Railex on 29 May 2016. 16 May 2016: Added new images of Lydgate Viaduct on 4 August 1968 and 70004 'William Shakespeare' approaching Westbury on 14 August 1966. 12 May 2016: Added some notes on DCC v DC, pros and cons. 10 May 2016: Further work on the Hornby Rebuilt Patriot 'Repairs and spares' chassis, this time involving the exchange of the wheelsets due to a sheared crankpin screw. 6 May 2016: A Hornby Patriot 'spares & repairs' purchase from eBay has allowed a detailed examination of the Hornby gear meshing and valve gear wreck issues that are a problem for the current generation of models from China. 10 April 2016: Chris Littleworth has kindly provided a selection of his signal box diagrams to illustrate the arrangements from Summit Tunnel to Todmorden. These include: Summit Tunnel East, Walsden, Dobroyd Crossing, Todmorden West and Hall Royd Junction. 4 April 2016: Very grateful to Andy Cooper of the Rochdale Model Railway Group for permission to include some images of the Group's 'Gauxholme Viaduct' layout. 3 April 2016: Added a page detailing the Great Wall of Todmorden. 2 April 2016: Recent pages covering the line from Todmorden West to Summit Tunnel slightly re-ordered, Network Rail bridge names added and navigation links added at the bottom of the pages to allow a virtual journey along the line. 29 March 2016: New pages added covering Winterbutlee Tunnel, and bridges 96 and 95, Bridge 92 (Walsden Brook Aqueduct) and Light Bank foot crossing. 28 March 2016: Added a pages detailing Bridge 102, Stephenson's famous wrought iron girder bridge spanning the Rochdale Canal, and also Bridge 103 at Todmorden West; bridges 99 & 100 between Walsden and Gauxholme and Walsden Footbridge. 28 March 2016: Grateful to Peter Dawson for more of the back-story of 80-82 Halifax Road, Todmorden. 27 March 2016: Created new pages of modern images of Dobroyd Crossing, footbridge 102A, and also for Gauxholme (Shade) viaduct Bridge 101. 26 March 2016: New 'After' images added to the site. 158904 departing for Moston at the western end of Todmorden Station; a class 158 on Todmorden Viaduct and Todmorden triangle from above Lover's Walk. 23 March 2016: Article reproduced from the Todmorden Advertiser regarding the introduction of the prototype covered L&YR bogie van for grain traffic from Fleetwood. 16 March 2016: Another selection of Eric Bentley's photographs added. A WD is seen approaching Copy Pit from the west a 52 wagon-haul, 48466 erupts from Home Tunnel at Copy Pit, and 'Sturdee' is caught with a Blackpool-bound excursion. 10 March 2016: Added a page detailing the work to restore a K's 'spares or repair' Edge Hill Jubilee for the 10.0 am Liverpool - Newcastle restaurant car express. 9 March 2016: The page of links to L&YR signal box images on the Web cleaned-up. A significant number of images have been removed from Flickr and the Pennine Heritage site has been re-indexed. 7 March 2016: Added part 3 of the 'Trains Illustrated' Calder Valley article as it appeared in the January 1956 issue. 6 March 2016: Very grateful to 'Modern Railways' to reproduce on this site a three part article that appeared in the 'Trains Illustrated in late 1955 and early 1956. Click here for Part 1, and here for Part 2. Part 3 will be uploaded next week. 23 February 2015: Further values added to the model locomotive stall current table. 14 February 2016: The Tin Bath ran with Jubilee Galatea and Black 5 44871 today. 4 February 2016: David Kirby and John Dilnot will be out and about with 'Calderwood' the model railway in 2016: dates and locations provided. 27 January 2016: Although the two DCC-converted Bachmann split-frame Jubilees ran well on the bench, their running on the layout was indifferent. Wiper pick-ups were thought worth trying. 26 January 2016: The layout needed more Jubilees and attention has finally turned to a couple of Bachmann split-frame types that have sat in the stock box for over three years awaiting their turn. This conversion focuses on providing tags for terminating the 'black'and 'red' wires on. 19 January 2016: The commissioning of an NCE Powercab continues. Further notes on why some of the kit-built locos run very slowly, and a possible solution. 17 January 2016: Norman Sutcliffe has kindly provided a set of photos showing the aftermath of an accident at Cornholme in 1967 when a Class 40 collided with a returning 8F banker. 11 January 2016: Further observations on the NCE Powercab, with notes on short-circuits and consisting. 23 December 2015: Some conclusions finally reached regarding the UK power adaptors available for the NCE Powercab. 9 December 2015: The last few weeks have been taken up with a power upgrade for the layout. Still further work required, but I've added some notes on initial experiences with the NCE Powercab. 26 November 2015: Pleased to report that the 'Train Tracker' is now fully functioning again as of 11.45 a.m. today. Apologies to regular visitor for any inconvenience caused. 25 November 2015: November has been a busy month, with a new control system installed on the layout; and problems with reversing loops relays. Running has been slowly deteriorating as a result of a losing battle with locomotive wheel cleaning. A final solution has now been devised with a dedicated wheel cleaning track. 23 November 2015: A temporary glitch in the Network Rail TD feed has temporary disrupted the 'Train Tracker' pages. Our technicians are working on the problem. 26 October 2015: First trains on the Oxford Parkway - Bicester South Junction line recorded on 25 October 2015. 11 October 2015: Some snaps of 'City of Birmingham' at Birmingham's ThinkTank museum added. 2 October 2015: A new downloadable backdrop added with a panorama shot in Todmorden. 9.5 feet long. 1 October 2015: Added addition notes regarding the original erection of the LYR signals at the Lincolnshire Coast Light Railway in 1962. 28 September 2015: Added two aerial views obtained by Nigel Trafford showing Stephenson's railway east and west of Hall Royd Junction. 26 September 2015: Added snaps of a Lanky Radial 10891 near Burnley around 1937, LYR 0-6-0s 12326 and 12352 passing Milner Royd Junction, and a Midland 3F and Lanky 0-6-0 head a passenger train towards Todmorden at Towneley c. 1937. 25 September 2015: A photo of the Gallows Signal from around 1937 is now to hand which this shows it was fitted with L&NW pattern arms sometime after 1922. 24 September 2015: Jim Claire has kindly provided details of the LYR siding signal at Skegness Water Leisure Park on the Lincolnshire Coast Light Railway. 22 September 2015: Provided a step-by-step guide to track ballasting. 20 September 2015: Grateful to Nigel Trafford for a wonderful aerial shot of Hall Royd Junction taken on 21 April 2014. 13 September 2015: The Metropolitan Line celebrated 90 years of the Watford Branch with steam trains running from Watford to Chesham. This page records events on 13 September 2015. 12 September 2015: A review of the history and available photographic evidence of Calder Valley bridge 109 provided. 11 September 2015: Photo survey of Wansford signal box on the Nene Valley Railway added. Also a survey of Stamford Main Station and Island Platform buildings. 10 September 2015: Added photo surveys of Llanuwchllun (GWR) and Stamford (Midland Railway) signal box photo surveys. 09 September 2015: Added links to a selection of David Bold's film clips on YouTube. First selection includes the Royal Tran passing Stansfield Hall; a Class 124 diverted from Standedge and a train of new Ford cars. 05 September 2015: Added a series of links to David Ball's Calder Valley signal box images at: Eastwood; Greetland; Hall Royd Junction; Hebden Bridge, Mytholmroyd; Sowerby Bridge Station; and Stansfield Hall Junction. There are some very detailed shots of the interiors of Sowerby Bridge Station and Hebden Bridge boxes. 04 September 2015: Steady progress on the layout the last couple of weeks: bridge 109 and shrubbery around the actual junction now nearing completion. 28 August 2015: A fascinating view from the Todmorden Advertiser of 17 July 1936 showing a very busy Stansfield Hall Halt. 26 August 2015: A further photo has been kindly provided by Gavin Morrison depicting Stanier 'Black 5' class 4-6-0 44928 with an express working to Leeds on 14 June 1961. 20 August 2015: Peter Rogers provided further detail about 1M89 being pulled by 40081 on 3 July 1982. 14 August 2015: Great strides have been made with the scenery around the Kiln Clough culvert and Bridge 109. 13 August 2015: Gavin Morrison has kindly allowed reproduction of two of his photographs taken in 1961. The first show 90181 heading towards Rose Grove, and the second 90523 running down the Down Goods loop. 31 July 2015: Added biographical notes about George Barnes and his passion for LYR signals taken from Lancashire & Yorkshire Railway Society Newsletters issues 202 and 203. 29 July 2015: Kiln Clough intersects the railway at Hall Royd Junction. The railway culverted the Clough, and following Network Rail clearing the undergrowth, and Google Earth recording the results, it is finally possible to model the feature. 24 July 2015: Added images of the L&NWR miniature ground signal at Llanuwchllyn, having discovered they were deployed in L&YR territory from 1922 onwards. This was probably 'found' by George Barnes when he sort to acquire a representative collection of signal types in the Bolton area. 20 July 2015: A 1931 snap from a family scrapbook shows Stansfield Hall Junction's advanced starter, signal 6, standing in front of Ferney Lee Bridge. 18 July 2015: Added a link to the Harlech Television 1976 documentary on the Bala Lake Railway which includes an interview with George Barnes where he describes the signalling system and shows how point rodding deals with expansion and contraction. Also features brief glimpses of the L&Y signalling. 17 July 2015: A photo survey of L&YR materials at the Bala Lake Railway was conducted on 16 July 2015. There is much of interest for L&YR enthusiasts, and a series of pages have been created. 25 June 2015: Tim Lowe of the Widget Shop has provided a detailed response to our review of the LaisDCC decoder, and we are happy to share Tim's comments. 24 June 2015: Geoff Cryer has kindly provided two photographs of the Bala Lake Railway's L&YR Home and subsidiary signal, the first showing the signal as originally installed in its L&Y/LMS/BR paint scheme, and then as repainted by the Bala Lake. 20 June 2015: Another eBay 'spares or repair' Black 5 has made it to the front of the restoration queue but required a replacement Comet chassis. This page describes the first 7-hours of construction, which achieves a working chassis with brake gear, and now awaiting fitting of the valve gear. 17 June 2015: Thanks to Anne Hewland for drawing attention to the 'Todmorden and Hebden Bridge Advertiser' issue of 7 May 1915 and steps being taken by the LYR to enable drivers to site distant signals following publication of the Smithy Bridge accident inspector's report. Created a page for L&YR signals, starting with detailed shots of a L&YR long shunting arm. 16 June 2015: Norman Sutcliffe has kindly provided a snap of the Jubillee that worked his Todmorden half-day excursion to Southport back in the early 60s, as it backed out of Chapel Street station. 15 June 2015: Norman Sutcliffe has kindly provided a series of photos taken by his father, Jack Sutcliffe, showing the Northern Rubber Special passing Cornholme signal box. 1 June 2015: Enthused with his journey over the Todmorden curve, Lancashire & Yorkshire Railway Society signal steward Chris Littleworth has kindly provided historical signal box diagrams for Stansfield Hall Junction and Todmorden East Junction signal boxes showing the layout prior to closure of the curve. The Stansfield Hall diagram has appeared in print before, and a summary of Chri's' five signal box diagram books are provided here. 18 May 2015: The first trains ran on the Todmorden curve with the start of the new timetables on 17 May 2015.Here are images captured of the first train from Blackburn to Todmorden, and the first train from Todmorden to Blackburn. 17 May 2015: Added a photo survey of Eastwood station, coal drops and bridge 115 undertaken on 17 May 2015. 13 May 2015: Added a page of 'Metroland' photos following a photo survey of the signal box and weigh-bridge at Chorleywood Station taken in April 2015. Also added a page recording the A60 Stock Farewell Tour when it visited Chesham on 29 September 2015. 28 April 2015: Following the acquisition of a Sutherland Models kit, some notes on the LMS (ex L&YR) 7F 0-8-0 Large Boiler goods locos have been provided. 19 April 2015: Added a note about the scrapping of Radial tank 50795 at Gorton. 15 April 2015: The work of pencil artist John S Gibb has allowed a 'Past & Present' comparison of Manchester Victoria sometime before the First World War, and now. Added a link to ex-Steamport Model Railway member Tom Bell's Shapeways Website - 3D printing of NG prototypes. 12 April 2015: A photo survey of the changes taking place at Manchester Victoria station conducted on 11 April 2015 on an official L&YRS visit. 1 April 2015: Added a photo survey of the Shipley Model Railway Society's 'Leicester South' portraying the Great Central Railway mainline in the 1960s. 31 March 2015: Started a Signal Gallery showing signals created using Hall Royd's own transfer sheets, starting with John Marsh's wonderful bracket (with repeaters) on Leicester South and Ralph Robertson's LMS ground signal, which can be bought directly from him. 30 March 2015: Provided a photo tour of the wonderful 4mm scale 'Calderwood' layout. 21 March 2015: Terry Tracey has kindly provided updated links for his collection of L&YR signal box images. 11 March 2015: Erratic running by the DJH WD 2-8-0 has been solved by fitting pick-ups on the tender: click here to see how it was done. 8 March 2015: A sequence of shots to show 'How to fit Romford crank pins'; the loco in question is a DJH WD 2-8-0 (90099 of Goole shed). 5 March 2015: Jubilee 45565 and Black 5 44890 put into traffic on Hall Royd, the model. 1 March 2015: DJH Stanier 8F 48666 chipped and released intro traffic at the model Hall Royd Junction. 27 February 2015: Wiring diagram for the ESU 21MTC Universal Adapter ESU part # 51967 provided. 26 February 2015: The instructions for the DJH Black 5 Kit reference K75 have been uploaded. 25 February 2015: The laisdcc chip as supplied by the Widget Shop was put through its paces today, as this short video shows. 24 February 2015: My ammeter arrived today, and the 'stall current' tests on a variety of popular 4mm locos completed, and the results tabulated. 22 February 2015: Progress is being made with documenting and programming a budget laisdcc DCC decoder, and a page has now been created for this topic. 11 February 2015: First glimpse of a sheet of 4mm signal arm transfers featuring Upper Quadrant corrugated arms for early period LMS, LNE and Southern Railway models, along with LNE discs, shunting signals and spectacle plates. 9 February 2015: Details of how to fit a 21-pin DCC decoder to a non-DCC loco. 4 February 2015: There is evidence that the work on the interlocking in Preston Power Signal Box required to allow a train to proceed in the Up direction from Stansfield Hall Junction to Todmorden Viaduct Junction has now been completed. 3 February 2015: CLC, GER and WR signal box diagrams enhanced with Google Streetview scenes. 1 February 2015: Added a selection of CLC and LNE signal box diagrams as photographed at the Mangapps Farm Railway Museum, including a distressed Northwich Central. 29 January 2015: The DJH Crab's initial pristine livery finally completed, and a shopping list of weathering paints compiled. 27 January 2015: Added two video clips produced by Signalling Guru Steve Hewitt showing signals he has made that use Hall Royd's own signal transfers: check out the GWR splitting distants and a pair of brackets for Woodford Halse. Lovely models, complete with working lamps and prototypical bounce. 26 January 2015: Two photos from the Eric Bentley collection showing excursion trains heading towards Copy Pit in 1966. 21 January 2015: Added some notes on the problems of spraying varnish from a rattle can in mid-winter. Photo survey showing application of Fox lining transfers to a DJH Crab. 18 January 2015: Provided an illustrated step-by-step guide for fitting a DCC socket and chip to a kit-built DJH Hughes 2-6-0 Crab. Also added details of a model bracket signal made by the LMS c. 1924 to demonstrate how slotting works. 17 January 2015: Steve Hewitt has started his latest signal build using a set of GWR 4mm signal transfers. 15 January 2015: A new series of photographs from October 2014 and January 2015 showing the new signals on the approaches to Todmorden and at Stansfield Hall Junction, including a couple of images of the Preston PSB panel on 11 January 2015. 13 January 2015: Having extended the Steamport Southport page, it seemed appropriate to bring the story up-to-date with a page created for the Ribble Steam Centre. 10 January 2015: Added a couple of snaps of Stanier Black 5 44806 and 3F tank 47298 at the Steamport Southport transport museum aka 27C Derby Road Motive Power Dept, Southport in 1975. 8 January 2015: Added a photo of an upper quadrant combined Home/Distant and Platform 1 starter at Skipton mounted on a Midland wooden post with finial circa 1978. The DJH WD 2-8-0 is now in the paint shop for its first undercoating. 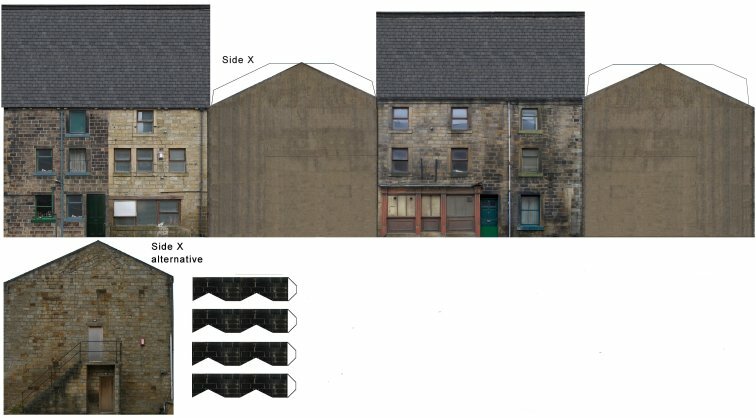 6 January 2015: More L&YR signal box Web images located for Crow Nest Junction and Atherton Goods Yard; plus an image of Baxenden Shoe Mill. 4 January 2015: A couple of track level shots of a Class 144 reversing at Hall Royd Junction have been kindly provided by Chris Haley. A revised realtime train tracker diagram has been provided for Roby courtesy of Phil Wieland. 2 January 2015: Created a page providing details of a proposed set of early LNER-style upper quadrant signal transfers. 1 January 2015: Further detailing added to the DJH WD 2-8-0 under restoration, including lamp brackets and injector feeds. 31 December 2014: A series of detail shots for railway modellers of Ivatt Class 2 46521; Black 5 45491 and Stanier 8Fs 48305 and 48624. Provided a photographic overview of the highlights of a day at the Great Central Railway, Loughborough 30 December 2014. 30 December 2014: A visit to Loughborough today allowed a series of detail shots to be taken of BR 7MT Britannia-class 70013 'Oliver Cromwell'. Sorry about the drifting steam but the temperature was hovering at zero degrees! 22 December 2014: More parts re-affixed to the DJH WD 2-8-0. 17 December 2014: Further work on the DJH WD 2-8-0 tender. 16 December 2014: At last! Full set of GWR OO 4mm scale signal transfers for steel arms with sheets for folded-edge, ribbed and shunt, disc and mechanical route indicator slides. Plus a sheet for the Ration plastic arms. 15 December 2014: Details of the restoration of an eBay 'spares or repairs' DJH WD 2-8-0. 13 December 2014: A nudge from Steve Hewitt has resulted in a beta set of GWR signal transfers produced for the MSE fret in 4mm scale, which Steve has kindly offered to test. 10 December 2014: Added a nice photo of the Up platform buildings on Todmorden's Platform 1 in August 1955. 7 December 2014: Some notes have been provided on how a workshop was set-up in a spare bedroom. 1 December 2014: Added Liverpool Lime Street to Manchester Piccadilly via Newton-le-Willows (Chat Moss route) to the Signal Box Watcher programme, although Roby still requires configuring as it is the first area to be controlled from the Manchester Signalling Centre, and our system needs to be updated accordingly. 19 November 2014: The Ks Stanier Black 5 bought from eBay in May was back on the workbench this week to have its tender fitted with a 'free' bogie and so transfer some of the considerable weight of the heavy white metal tender to the driving wheels. 17 November 2014: More actual railway modelling this week so less posting. However in the process our Hornby Black 5 blew its sound chip for no apparently reason. 8 November 2014: A snap of the 'Bradley Wood Junction' signal box nameboard as stored in the roof of a garage near Brighouse on Saturday 8 November 2014. The two boards from Brighouse Station box are behind it, but not visible. 27 October 2014: Comparative scans of shunting signal arms, disc signals and diamond plates made by MSE, Alan Gibson, Ratio, Spratt & Winkle and Scaleway added. 23 October 2014: A couple of shots from the Eric Bentley collection added: two 8Fs storming Copy Pit with a mineral train for Rose Grove, and 42616 at Bradford Exchange in 1966. Also added another shot of prototype Pacer 140.001 at Brierfield. 22 October 2014: It is exactly 124 years to the day that a meeting held at the Board room, Roomfield school on 22 October 1890 with R.Crabtree [chairman] and J. Learoyd ordered Miss Jackson and Miss Emily Hayes be invited to meet the Committee at Roomfield Girls School and take charge of classes. They were allowed to claim third class return train fares, Mrs. Hayes travelled from Manchester using the services of the Lancashire & Yorkshire Railway. On 30 October Mrs E.A.Hayes was confirmed as mistress of Lanebottom board School at a salary of £60 per annum subject to three months notice from either side. Mrs Hayes can be seen in the photograph on the steps of the school at Lane End, with her daughter, who also became a teacher in the area, and is my grandmother. 21 October 2014: Further effort being put into signals this week, with the bracket for the Up Passenger Loop being trial fitted on the layout. 14 October 2014: The gap in posts is due to work now starting on a final set of signals for the layout. This follows critical prototype information being gleaned from the Richard Greenwood 'Steam World' Volume 25 video. There will be more on this in due course, but the down starter from the Copy Pit line is done (L&Y wooden post, LNWR metal post cap, UQ LMS arm and L&Y balance weight under the access platform), and the post for the bracket for the Up Passenger loop with four arms (previous photographic evidence showed three) is also done, with the arms now having their transfers applied. However, have had time to provide an update on finding a suitable transformer/clean 12 volt DC supply for the Minx Point and Signal actuator. 8 October 2014: Telerail have kindly allowed a series of screengrabs to be taken from Volume 25 of the 'Steam World' TeleRail DVD, which show how excursion trains were reversed round the Todmorden triangle. The material is from the Richard Greenwood archive, and is highly recommended! 5 October 2014: Following an article in the October 2014 issue if 'Steam Days', the two W&T OO scale 6-wheel Palethorpe's Sausage Vans were dug out of the stock box and given a run. A brief resume of the history of the vans, their routes and published references provided. 25 September 2014: The Minx point and signal actuator looks like a genuine alternative to solenoids, Tortoises and servos - Hall Royd has installed one and is quite impressed. 19 September 2014: Revised the entry page for the free downloadable PDF structure kits to include pictures of the completed structures. A couple of missing signals added to the Farington Jn 'Signal Box Watcher' diagram spotted during the run of the Natterjack rail tour. 18 September 2014: LMS Asbestos Lamp huts are needed for Hall Royd Junction and there are issues with the new Hornby model: a correctly scaled Asbestos Lamp hut PDF downloadable kit is now available. The second train to carry passengers on Todmorden Curve to Stansfield Hall Junction organised by UK Railtours ran on Thursday 18 September 2014. The original plan was to traverse the Todmorden Curve from the Stansfield Hall Junction end, but due to the fact that interlocking remains as from when this was the site of the banking siding, trains can still only run towards Copy Pit. Sadly we were unable to make this tour, but 'Signal Box Watcher' did allow progress to be checked from Salford to Wigan Wallgate, and from Bescar Lane into Southport Chapel Street. 16 September 2014: Chris Littleworth has kindly provided the time and date for the closure of Brierfield signal box. A family snap taken of the Welsh Highland Railway's 'Russell' whilst at Towyn added. 15 September 2014: The Signal Box Watcher code - which allows trains to be tracked in real time - has been stopping for no obvious reason, with no errors recorded in the log. Should there be no activity for 3 minutes, a sub-routine has now been implemented to automatically re-start the system. Be interesting to see what happens on Christmas Day... Also re-shot the GWR spectacle plate bolt detail for the on-going GWR signal transfer project. And the shake down running of the 4mm-scale Hall Royd Junction is now progressing with the approaches to the new storage sidings re-schemed and re-laid, and test running mileage starting to build. 12 September 2014: A set of Ratio plastic GW signals have now been obtained to see whether a separate set of transfers will be needed for these. Shock horror: the notionally identical arms in Ratio kits 467 and 468 not only differ from each other, but also from the MSE etch! 11 September 2014: The GW signal transfers continue to amuse and frustrate. Have concluded that the MSE fret is a very nice item indeed, there is an issue with the distant arm. Further research has found that the very neatly moulded Ratio plastic signals have the same fault, so transfers will have to be provided for both MSE/Ratio and 'scale' distant arms - only this being the Western that means four transfers as they'll need to be both folded-lip (BR WR) and ribbed (GWR) types produced. 9 September 2014: A straw pole has found GWR modellers wanting transfers for both the MSE etch and 'dead scale' on the same sheet. Dimensions for a GWR home signal arm now provided for anyone wanting to make their own arms. 4 September 2014. Added notes from Peter Squibb's 'A Scratchbuilder's Guide Semaphore Signal Construction' regarding GWR Route Indicators. 2 September 2014: The GWR signal transfers are now coming along, with the route indicator screens mastered. A variety of texts are being offered, based on both prototype and model needs. 29 August 2014: Focus on 'Signal Box Watcher' this week, with the Liverpool arm of the WCML mapped out. However, this remains a 'work in progess' as the Network Rail TD feed has some 'holes' in it, notably around Atherton and Speke Junction. However the platforms at Liverpool Lime Street are present and correct! A workable image of a set of GWR ribbed steel arms is now to hand (still not ideal but sometimes you have to work with what you can get), and progress has resumed on the GWR signal transfer set. Still no ETA for this item. 12 August 2014: Added Mickle Trafford to Mouldsworth on the Chester-Northwich route to the Chester PSB diagram. 10 August 2014: Realtime Signal Box Watcher now includes Chester General & Approaches from Saltney Jn & to Mickle Trafford. 9 August 2014: Added Rock Ferry - Hooton - Chester General - Ellesmere Port and Weaver Jn - Crewe Coal Yard to the Realtime Signal Box diagrams although still some issues with signals at the Crewe PSB fringe. 5 August 2014: On a roll with the Realtime Signal Box diagrams: Merseyrail Wirral lines from the Liverpool Loop to New Brighton, West Kirby and Hooton, and including Bidston Dee Junction, and the connection to the Northern Line added. 3 August 2014: The Liverpool-Southport realtime signal box diagram re-calibrated to show more signals, and Liverpool Central corrected. Found an issue with the 'XZ' data from Network Rail - Speke Junction in the real world, so the Allerton - Ditton Junction diagram remains a 'work in progress'. 31 July 2014: All lines lead to and from Hall Royd Junction. This is a fact which is not generally understood or appreciated by the wider rail community. To prove the claim, the Network Rail TD feed has been used to provide a series of 'real time' signal box diagrams, that allow trains to be tracked by train describer number from Hebden Bridge through to the Scottish border or down to Preston Brook just south of Warrington. This project is still in its beta test phase, and pages are still being edited as new signal locations are identified. Any corrections much appreciated. 9 July 2014: Updated the LNWR signal box kit page, with two photos of the finished 4mm model. Launched a new page providing comparative Twitter feeds for Northern Rail, Merseyrail and Metro in real time. Sorry about the language but some people get very, very angry about the service they receive. PassengerFocus must be talking to the wrong people. 8 July 2014: Added L&YR signal box photo links for Cherry Tree Junction, Chorley 3 & 4, Whithnell Brick Sidings, and Withnell Station. 4 July 2014: Added a photograph of Stanier 'green' 5 44806 in steam on the one an only occasion it was steamed at Steamport Southport. 26 June 2014: Created a new page for Todmorden East Junction featuring two photographs taken by Eric Bentley in 1966 and 1967. 24 June 2014: Added a link to the SixBells Junction Website giving details of the Northern Rubber excursion. 23 June 2014: An Eric F Bentley photo added showing Hall Royd Junction - Stansfield Hall - Todmorden East with a Halifax – Blackpool North relief at 9.25 on Saturday 16 September 1967 with a Black 5 hauling six BR Mark 1 carriages. 21 June 2014: 2mm and 7mm versions of the free downloadable PDF card kit of the preserved L&NW signal box at Hartington uploaded. 20 June 2014: RailCam's handily placed Eastwood cam has allowed today's three freight workings in the Calder Valley to be checked, including a screengrab of the Seaforth - Tinsley flats at 19:05. 20 June 2014: New downloadable kit added for an L&NWR Type 5 signal box in 4mm scale. 15 June 2014: A wonderful shot by Eric Bentley added showing the empty newspaper vans from Newcastle for Manchester Red Bank heading through Todmorden on Sunday 3 April 1966 at 17:30 hauled by Class 45 Peak D81. 10 June 2014: Added a photo survey of the L&NWR permanent way hut at Hartington, including interior shots. 7 June 2014: Tutbury Crossing Signal Box is another surviving LMR crossing box, as seen on 7 June 2014. 6 June 2014: Click here for a photo survey of L&NWR stone built bridges at Tissington. 4 June 2014: Updated the section on the changes to the Preston PSB panel to accommodate the Todmorden West curve - scroll to the bottom of the page. 2 June 2014: Additional clips and photos of The Topper Chopper added, with thanks to David Greenfield and Mike Taylor. Also early details of the next booked service: The Natterjack from Euston to Southport via Burnley and Todmorden on Thursday 18 September 2014. 1 June 2014: The Topper Chopper ran; completed its full itinerary and to time! A really great day, brilliantly organised. Click here to see a clip showing the new signals, the new footbridge at Dobroyd Crossing and the junction from Todmorden Viaduct Junction to Stansfield Hall Junction. 30 May 2014: Added details of the final route for the Topper Chopper, including the passing times for Todmorden and Stansfield Hall. 25 May 2014: Added the Bachmann Service Sheet for the Standard Class 4MT 2-6-4 tank 33-354, as it does not appear to have been posted on any of the official sites. 24 May 2014: A visit to Railex in Aylesbury has allowed a further selection of baseboard joints using copper-clad fibre-glass to be studied on 'Alloa' and 'Dewsbury'. A photo study of Dewsbury also provided, with a couple of shots of Bradfield Gloucester Square. 14 May 2014: New date announced for the Topper Chopper. 14 May 2014: New loco for Hall Royd the model. A K's Black 5 ex-eBay arrived this morning in the post without motor, bogie and some key valve gear elements: restored to near past glory in the lunch hour! 13 May 2014: It was all looking so good. Sadly problems with commissioning the signalling means that the Todmorden Viaduct Junction - Stansfield Hall Junction line won't be available for traffic on Saturday 17 May 2014, and Network Rail are saying that the new commissioning date will be the bank holiday weekend of 24 May...the day that The Topper Chopper was due to run. 8 May 2014: The last week has been spent shaking down the Red Bank empty newspapers van rake. Wheels and couplings have needed attention. Also some vehicles collected over the years are now deemed unsuitable and details of a kit-built LNER GE-section Pigeon Van currently on eBay are provided here with a snap of it in the model Newcastle-Red Bank train. 27 April 2014: The new storage yard was completed, and the trains recovered from the layout. 24 April 2014: Amended details for the Topper Chopper railtour, with the reversal at Chester due to closure of the WCML in the vicinity of Weaver Junction now shown. 20 April 2014: Added a photo showing the method of creating a sub-frame assembly to support the baseboards. 19 April 2014: Rearranged the Model pages with an Index page to aid navigation. Added three pictures from Andrew Stopford showing the initial clearance and laying of sleepers at Stansfield Hall. 12 April 2014: Added a couple of shots of the Cotswold Radial tank kit assembled as 50850 and the Dapol Pug. 10 April 2014: Grateful thanks to Neil Harvey and loose_grip_99 for permission to feature their photographs of Stansfield Hall Junction. 9 April 2014: New storage yard completed, including a 16 foot long road to hold the complete Red Bank empty newspaper van train, which usually loaded to 22 doubled headed vans. Items of a railway interest identified in Todmorden Album Volume 3, including shots of the Hall Royd engineering sidings c.1910, and the Up distant bracket (lever 32) c. 1905. 4 April 2014: Added L&Y Railway signal box links from the Terry Tracey collection, with thanks to Terry for alerting us to it. Also added an image of 48701 leaving Millwood Tunnel and taking the line to Copy Pit, courtesy of rail-online.co.uk. 2 April 2014: An image to wet the appetite of the forthcoming Topper Chopper railtour showing DRS-owned 20 308 and 20 309 hauling the Carlisle Excursion railtour over Little Dale Beck on 7 July 2012 taken by Julien King. Added a page for Brierfield Station footbridge. 1 April 2014: Timetabled non-passenger carrying trains to start using the Todmorden West curve from Sunday 18 May 2014. Details of the Pathfinder Tour using the Todmorden Curve on Saturday 24 May 2014 are now available. Added a page describing how to fit DPDT slider switches to copper paxolin points for storage yards. 31 March 2014: Added a superbly atmospheric shot of Manchester Victoria in May 1968 provided by Desmond Summers. 30 March 2014: Noted that the closure of Brierfield and Nuncoat boxes may have been premature. Added details of the withdrawal of L&YR Radial tanks in the period 1951-1954. 29 March 2014: Added further details of the 3M05, the Bradford-Rochdale fledgling parcels working. 28 March 2014: A simple method for joining Peco Streamline Code 70 to Code 100 OO gauge track without the need for a translator track explained. Details of the evening Mytholmroyd - Rochdale fledgling special powered by Low Moor's last Stanier tank 42616 provided. 26 March 2014: Commissioning date for Todmorden West curve now 12 May 2014. Added further detail of the shotcreting technique as used by the Ffestiniog in 1976 to the Holme Tunnel page. Added two 'present' shots to the Hall Royd page as a counterpoint to a Ben Brooksbank's 1950s shot, and noted that there is not a single signal at the junction these days! 25 March 2014: Added the Network Rail official photos of the Holme Tunnel rebuilding to a new dedicated page. Check out the shotcreting - first used for a UK rail tunnel by the Ffestiniog Railway when it cut the New Moelwyn Tunnel in 1976. 24 March 2014: Renamed the page relating to the footbridge at Eastwood, as discovered it was Bridge 117 and not 165, which appears to be a Planning Department reference. Also added a page for Stansfield Hall footbridge. Added further L&YR signal box image links courtesy of Pennine Heritage. Simon Foster reports the Network Rail Measurement Train ran passed through Holme Tunnel on Sunday morning around 11 a.m., as a prelude to the reopening of the Copy Pit line today. Created a Huncoat level crossing box page. Have started a group of pages for The Trains of Hall Royd, starting with the Red Bank empty newspaper vans. This also features trains that SHOULD have run via Hall Royd but didn't due to historical accident. These include the Class 128 Parcels DMUs; the positioning move for DP1 from Liverpool to Leeds which went via Standedge; and a Radial tank on local passenger duties. 23 March 2014: On a visit to Stansfield Hall Junction on Sunday morning, signal PN339 had been taken down and removed since Saturday morning. 23 March 2012: Added a selection of snaps taken at Stansfield Hall Junction showing the newly reconnected curve and facing crossover. Starting to look like a junction again. Added extracts from the Lancashire & Yorkshire Railway's Private Siding Diagram book to the maps page showing the arrangement of the private siding for one J Fielden at Hall Royd. A photo survey of Bridge 118 at Eastwood added. 22 March 2014: Bridge 117 at Eastwood is slated for replacement by Network Rail. A photo site survey was conducted at 06:32 on Saturday 22 Match 2014. Later in the day Nelson Station and Brierfield Signal Box were visited and a photo survey carried out. Additional 'present' photos were added to the Brierfield-Nelson-Colne branch page. Added a 'present' shot showing the new crossover installed at the eastern end of Todmorden Station as at 22 March 2014, and also the connection at Stansfield Hall Junction now laid in, but signal not yet repositioned. 21 March 2014: Added a link to Terry Tracey's collection of 450 signal box images, including the L&YR. Also a note about the last day of operation of Brierfield and Huncoat boxes on Saturday 29 March, after which the Colne branch closes for a make-over. 11 March 2014: Thanks to RMWeb contributors, details of the York Motive Power Deport instruction carriage that passed Hall Royd Junction in 1960 have come to light. It would appear that this is a Diagram 23 third. Michael Harris' 'LNER Carriages' provides the identity of the ex-LNER Observation Car caught at Mallaig in 1981. 6 March 2014: Added another photo from the G Roose collection showing a Class 101 at Hall Royd Road bridge, and reorganised the pages to create a 'Past & Present' sequence to record the changes from the steam-powered railway of the mid-1950s to the modern scene with construction work in evidence and a GSM-R base station prominent in the foreground. The page analysing the 'historic' view of Hall Royd from the end of the platform at Todmorden is now here. 26 February 2014: David Greenfield has kindly provided a series of shots showing the current state of Stansfield Hall Junction, with the new point on site but not yet laid in, and the track forming the new curve still some yards short of the actual junction. 20 February 2014: New signal transfer sheets for O and N scale Upper Quadrant signals added. 17 February 2014: Added two of Ben Brooksbank's splendidly atmospheric photos from the mid-1950s showing action at the Engineering Sidings and then at the water tank. 31 January 2014: A couple of weeks ago an uncut version of 'Brief Encounter' was loaded onto YouTube. The well-known stars are Celia Johnson, Trevor Howard, and Stanley Holloway...but there was one other star that was largely forgotten: Stanier 4MT 2-6-4 tank 2429 that takes Celia Johnson home from Milford Junction. The connection is that the number plate from 42429 lives under the baseboards of the model Hall Royd Junction. This page records the film star to scrap yard story of 42429. 26 January 2014: Bachmann Radial Tank 50795 steps out onto Hall Royd Junction's rails for the first time. 14 January 2014: Additional links added to L&Y Signal Box photos list, with thanks to Andrew Eccles. Started adding links to signal box diagrams. 8 December 2013: An incident at Tan-y-Bwlch: 7 August 1966. The Festiniog Railway Society celebrates 60 years in 2014 and has invited members to offer their stories of how they first discovered the Festiniog, and here's mine! A series of photos showing a 'Linda's arrival and notional failure at Tan-y-Bwlch, and the solution adopted by the crew to get the train home. 29 November 2013: Finally two GWR pre-1930 GWR ribbed Home Signal arms turned up on eBay, although one sadly had a terminal attack of tin worm. This now allows the promised set of GWR signal arm transfers in OO and O scale to be mastered over the Christmas break. 18 November 2013: Added chart from Preston Signal Box re-signalling Special Notice dated October 1973, showing new signals and revised track layout. 15 November 2013: A 'it could have happened' moment using the NRM's wonderful model of Deltic DP1 travelling from Liverpool to Leeds in January 1958. This is a wonderful prototypical 'short' train featuring DP1, two vans containing of spares and consumables, and an LMS brake. The real train went via Standedge, but what the heck. 14 November 2013: Added a page and photo of the Steamport Model Railway Club circa 1971. 20 October 2013: I was told by my son to keep Thursday and Friday 17 & 18 October free for a secret birthday treat sponsored by the family.The departure point was in the North West and I trawled the Web for special events: Settle & Carlisle and fine dinning on the Worth Valley, East Lancs, etc. all seemed likely possibilities. Not in a million years did I think 'Jacobite' or that there'd be some bonus additional bonus footage on the Saturday with a photo-special involving both Black 5s out towards Rannoch. 14 October 2013: Richard Greenwood has identified himself as the copyright holder of the image depicting 9F 92059 at Hall Royd Junction. The photograph was taken on 6 August 1960 in the early afternoon, his negative number ER20. Hall-Royd-Junction takes copyright very seriously: both in terms of images supplied to us, and of their subsequent use. Richard has also provided further detail on how the banker's accessed their siding and changes made to the track layout to make life easier for diesel drivers. 11 October 2013: Simon Foster has kindly provided some shots showing the changes being made at Stansfield Hall, with a very neat 'Past & Present' shot, together with a view of the modern Hall Royd signal box diagram in Preston PSB. 11 September 2013: Summer is over...and the modelling season is now open!! A sub-frame for the scenic boards of Hall Royd the model has been created, allowing them to be rotated for working on the underside. 30 August 2013: Detailed close up shots of signal masters for the OO Upper Quadrant signal transfers added. 24 August 2013: Added a countdown for the re-opening of the Stansfield Hall - Todmorden East chord on the Home Page: just 266 days to go! Also added to the Facebook page a tale of not booking two returns to Leeds the Websites of the three Train Operating Companies involved. 4 August 2013: An image of an ER inspection saloon containing LMR drivers out learning the road passes Hall Royd Junction in the snow in early 1960 added to the site. 31 July 2013: Photo of Class 111 3-car DMU on 5 October 1979 approaches Hall Royd Road bridge with Yorkshire bound service. Flooding at Walsden and links to video of trains stopped by the flood water added to Hall Royd Junction Facebook page. Also news of start of rebuild of Manchester Road station, Burnley. Date for start of services via Todmorden West curve given as 18 May 2014. 26 July 2013: Facebook page now alive and well. Created link to English Heritage listing of Hebdon Bridge box. 4 July 2013: Garage doors as originally fitted in October 1962 located and Hall Royd pre-cast lock-up garage blocks updated. 26 June 2013: Downloadable free kit of Hall Royd pre-cast lock-up garage blocks uploaded. 23 June 2013: Downloadable free kit of a small industrial unit in 4mm scale suitable for periods covering 1928 - 2013. 22 June 2013: Added search function to the header on all pages. Also rescanned a number of images on Todmorden, Copy Pit, Hall Royd and Stansfield Hall prototype pages. 18 June 2013: Free downloadable kit for a L&YR 4mm brick-based Size 6 (3-2-3 configuration) signal box uploaded. 14 June 2013: 2mm free house card kit download re-worked following feedback. 13 June 2013: 4mm free house card kit download re-scaled to bring it into line with conventional model house styles (i.e. prototype appeared larger that other properties users were placing it with!). Door frame now scales out at 6.5 feet. 5 June 2013: Continued 'Google Railview' series, completed the Liverpool - Southport line, and started Southport - Manchester line to Burscough. 28 May 2013: More links added to list of L&YR signal box images, including Hesketh Park in 1967 (Preston-Southport) and amplified the caption of the Cravens unit approaching Todmorden from Copy Pit, providing location and date. 26 May 2013: Further links added to list of L&YR signal box images, including West Lancashire Railway (Preston-Southport) and Blackrod & Horwich. 24 May 2013: Link added for Stansfield Hall signal box to list of L&YR signal box images, and three broken links fixed. Also added image of BR Standard 9F 92059 wheeling a returning excursion from Blackpool and heading for Yorkshire under Hall Royd Road bridge on 6 August 1960. 22 May 2013: Updated Hall Royd page to show Class 101 passing the site of the signal cabin in 1984, and modern day equivalent showing vegetation cut back. 21 May 2013: Added photo of Jubilee 45565 standing at Stansfield Hall taking water with excursion 1M91 on 23 July 1966, and twin-power car Class 105 approaching Todmorden from Copy Pit. 19 May 2013: Added a newly acquired photo of Black 5 45260 passing under Lower Laithe House footbridge at Hall Royd Junction with empty mineral wagons on 23 July 1966. 17 May 2013: Added a photo of Todmorden Station in the 1980s with a Manchester-bound 6-car Class 110 and a close-up of the original waiting room on Platform 2 prior to demolition. 12 May 2013: Pannier tank mounted on plinth and finishing touches applied. Final mounting arrangement shown. 11 May 2013: Photos added of Class 40 40081 at Cornholme on 3 July 1982; Class 37s 37153 and 37202 heading to Copy Pit; and Class 110 at Halifax on 2 January 1987. 10 May 2013: Details of a photograph in 'The Development of Todmorden 1700-1896' showing the original Todmorden East and Hall Royd signal boxes, coal drops, etc. added to the Bibliography. 9 May 2013: More links added to list of L&YR signal box images on the Web. 6 May 2013: Photo log of a day out at Didcot Railway Centre to record 1933-signal arms for GWR signal arm transfer project added. 3 May 2013: More links added to list of L&YR signal box images on the Web and identified photographs containing images of LMS asbestos lamp huts. 2 May 2013: Added photo of D347 passing Portsmouth with returning excursion 1E64 on 25 August 1973, and upgraded picture of WD 2-8-0 90348 (56A Wakefield) banking the 'Northern Rubber' special (Retford to Blackpool) up to Copy Pit summit at 13:05 on Saturday 30 September 1961. Now includes foreground detail. Did 'Mallard' 'crack' Copy Pit in September 1961 or was it banked to Cornholme like everything else? New photographic evidence has come to light...check it out here!